Please join us on 18th February for the next in our series of research seminars. This presentation will explore aspects of the input of tourism to regional development policies. Specifically, the possibility is explored that there can be a realistic role for sustainable tourism premissed upon the conversion of intangible cultural heritage (ICH or ‘living culture’) from an inward-facing phenomenon practiced by indigenous communities to an outward-facing phenomenon offered to visiting tourists. The challenge is to introduce that living culture to external paying audiences in a sensitive way such that it does not place very special, extremely delicate and sometimes sacred non-material heritage at risk of damage, dilution or destruction. Key ICH issues will be examined in the geographical context of contrasting case study sites across Scotland and in the conceptual contexts of identity, authenticity and inclusion. The objective of doing so is to assist in identifying common aspects of endeavouring to sustain living culture through tourism with a view to enabling a model of best practice, applicable across cultures, to be developed and tested with a view to wider dissemination and application – and to delivering impact. Alison McCleery is Professor of Economic and Cultural Geography at Edinburgh Napier University. She holds a 1st Class Honours Degree in Geography from St Andrews and a PhD from Glasgow on the topic of regional development policy. She has since published widely on North Atlantic peripheral rural areas, including on France where she both lived and worked briefly. More recently Alison’s work has evolved to embrace Intangible Cultural Heritage, the formal term used by UNESCO to denote what is often referred to as ‘living culture’. In 2013 she was both an invited speaker at the Smithsonian Institute in Washington DC and a keynote presenter at celebrations in Venice to mark the 10th Anniversary of the 2003 UNESCO Convention on the Safeguarding of the Intangible Cultural Heritage. Committed to the capacity building of early career researchers, Alison sits on the boards of both the ESRC Doctoral Training Centre and the AHRC Doctoral Training Partnership for Scotland. ICCHS is thrilled to announce the publication of ‘Displaced Heritage: Responses to Disaster, Trauma, and Loss’, the 16th volume in its ‘Heritage Matters’ book series. The publication has a strong ICCHS presence with Peter Davis and Gerard Corsane co-editing it Ian Convery. In addition, there are papers by ICCHS staff Gerard Corsane, Susannah Eckersley and Aron Mazel and by former ICCHS PhD students Sarah Elliott, Bryony Onciul and Diana Walters. 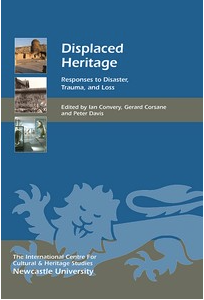 Displaced Heritage (Edited by Ian ConveryEdited by Gerard CorsaneEdited by Peter Davis) 9781843839637 – Boydell & Brewer. The essays in this volume address the displacement of natural and cultural heritage caused by disasters, whether they be dramatic natural impacts or terrible events unleashed by humankind, including holocaust and genocide. Disasters can be natural or human-made, rapid or slow, great or small, yet the impact is effectively the same; nature, people and cultural heritage are displaced or lost. Yet while heritage and place are at risk from disasters, in time, sites of suffering are sometimes reframed as sites of memory; through this different lens these “difficult” places become heritage sites that attract tourists. Ranging widely chronologically and geographically, the contributors explore the impact of disasters, trauma and suffering on heritage and sense of place, in both theory and practice. Participation and community engagement are a key focus of UK museum policy and practice, increasingly used as a strategy for securing the museum’s continued relevance and purpose in contemporary society. Over the years the dynamics of participatory practice have been interrogated in critical ways to highlight the complex issues arising from collaborative work. This paper argues that so far, certain models of participation have dominated both theory and practice. Established models tend to prioritise institutionally-bound forms of engagement which benefit the museum first and where participation is imagined through certain codes, languages and knowledges that are expected as valid and valuable forms of contribution. Because participation is instigated and contained within the institution, despite its transformative rhetoric, such models ultimately maintain the museum institution as it is. The limits of such a model encourage us to explore other models that reconfigure the relationships between museums, culture and communities. Drawing on ethnographic research at Tyne and Wear Archives and Museums, this paper puts forward the notion of care to develop a conceptual reconfiguration of community engagement in museums. The paper introduces the geographies of care literature as a starting point to examine the practices and ethics of care already existing in museum engagement work, and argues that considering museums as spaces of social care can help to shape new models of community engagement in and with museums. Care opens up a critical politics that reverses the terms of participation to benefit communities first, and has the capacity to reposition the museum within more distributed networks of engagement with communities. Dr. Nuala Morse is an interdisciplinary researcher with a background in cultural geography and museum studies, and specializes in participatory research and practice. She recently completed a doctorate at Durham University in collaboration with Tyne & Wear Archives & Museums, which examined the cultures of participation in museums – in particular, how museum professionals across different teams understand, practice and perform ideas of participation, as well as the organisational challenges for embedding participatory practice and democratising museums. Nuala’s research also focuses on the role of the museum as a space of social care, and the links between museums and wellbeing. She is also interested in the co-production of museum knowledge and exhibits and the distinctive nature of professional museum work.